Extensible IT delivers IT platforms that work together to create an open and flexible environment that can cross geographical and virtual boundaries. This enables companies to embrace digital transformation. Extensible IT components snap together and allow for seamless management. Over the past few years a transformation has taken place in how IT is delivered. This new dynamic, brought on by cloud solutions, has resulted in the breakdown of IT silos and shown the need for a more matrix-led IT department. It has created the opportunity for new processes and retooling, as well as a new consideration of how IT is run and the value it brings to an organization. Extensible IT technology is characterized by a capacity to append additional elements and features to its existing structure. This creates flexibility, which allows you to be more agile and responsive to business requests. Extensible IT is a framework that enables digital transformation by making it easier to deploy new business services. It no longer matters whether it is on site or in the cloud. Extensible IT gets you to a place where everything is easily deployed and managed, utilizing service management to make things work well together. 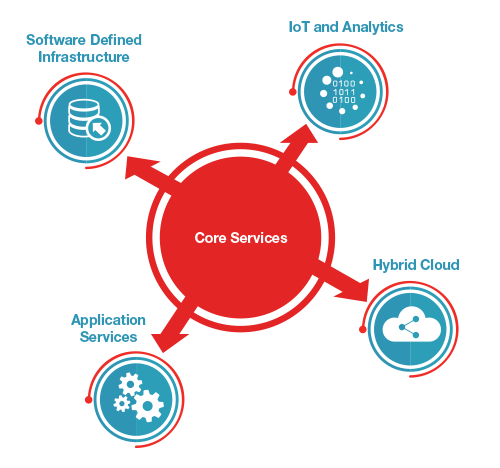 The Extensible IT Core technologies provide a foundation for enabling technologies and services to work effortlessly together. 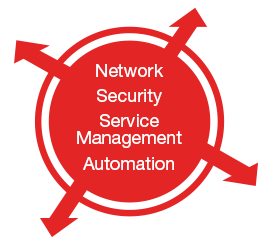 The Core components are designed to work together and allow IT services to easily snap on. The days of component-based IT infrastructure, chosen on the basis of legacy application workloads, are gone. Software-defined infrastructure components are designed to work in a flexible environment that can be managed easily. There are many cloud options available today, allowing you to consume personalized IT services that scale and grow. Integrating and managing them is the key to success. Managing standardized applications on site requires a lot of work, with little return. Moving these applications and their support to a service reduces costs and delivers higher value. Taking it to the next level means using IT as a business asset. Utilizing your data in a way that provides business value is the key. IoT and analytic services can help you find ways to make better use of your greatest assets. Logicalis offers consulting services to help you determine how to utilize IoT and analytics to improve your IT services or offer new services aligned to your business.